Over the years, I’ve helped parents get over all kinds of obstacles with their kids. When mistakes happen, it’s always a good idea to be aware of what you’re doing so you can adjust your reaction to your child’s behavior. This helps you become a more effective parent. I also remind parents that we all make mistakes. And I encourage parents to give themselves a break when they believe that they have made a mistake. After all, it’s impossible for any of us to be perfect. And it takes time for us to learn and put into practice effective parenting techniques, especially when dealing with child behavior problems. It’s hard not to take it personally when your child misbehaves or says something hurtful to you. I think it’s important to accept that you will get upset from time to time and your feelings will be hurt, especially when their misbehavior is targeted at you. You may think that your child doesn’t care about your feelings. The truth is, he probably doesn’t. Adolescents just don’t have a lot of empathy, especially for their parents. As they grow and mature, they will get better about caring about your feelings, but for now, they just don’t. Therefore, it is critical to focus your energy on changing the behavior and not on how the behavior makes you feel. This is hard to do, but with practice, it gets easier. And, your parenting will become more effective. And you will feel better. I’ll then ask, “What was going on when your child wasn’t respecting you?” The answer might be, “Well, he wouldn’t do his homework.” Or “She won’t clean her room.” I actually like to hear that, because now we have something to work with. We have a behavior that we can address, instead of an emotion. We then focus on the behavior with thoughtful and effective consequences and other strategies. I often recommend that parents set up a structure and realistic goals that their kids can work toward rather than lecturing their children about how they should be respectful. Lecturing kids is just not effective. If it were, our jobs would be easy! Remember, as the behavior starts to improve, our feelings will improve along with them. Parents sometimes assume that their child has more understanding about human nature—and how he should behave—than he actually does. For example, for younger kids, sharing does not come naturally. It needs to be coached and learned. So, don’t expect your child to easily learn to share. It may take some time. Set your expectations appropriately and coach the child and try not to get angry. Some young children have an advanced vocabulary, and it’s easy to assume their verbal ability indicates they are also physically and emotionally advanced. But they are not. As James Lehman points out in The Total Transformation® Program, “They’re not little adults, they’re children.” You can’t expect your child to have the same kind of empathy or discipline or skills that you do. They simply don’t have that capacity yet. This also shows up with teens. There is an expectation that teenagers should feel gratitude, be empathetic, and be future-oriented. The truth is, teens are very selfish and short-term in their focus. That’s part of the developmental stage they’re in as adolescents. It’s our job to teach them empathy and goal-setting. I don’t think there’s any point in getting angry with your child for something they can’t do yet. Knowing what your child is capable of at a certain developmental stage can really help you to have reasonable expectations for them. Regardless of your child’s diagnosis or disability, he still has to figure out how to get along in society. This is absolutely true. But some parents take it to mean that all kids can and should respond to the same kind of parenting. 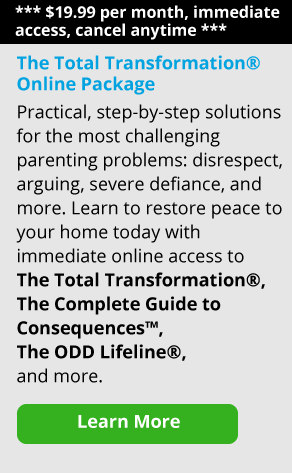 The truth is, for kids with ADHD or other diagnoses, your parenting style will have to change a bit to be effective. Simply setting up a structure and using consequences to keep a child with ADHD on task, as you would for a child who does not have it, will usually not work. In fact, it’s been shown that children with ADHD respond better when you alter the rewards and consequences system. You also may need to accept the fact that before their meds kick in, they are going to have a challenging time getting ready for school. So even though the end result is that you want your child to function in society as an adult someday, that doesn’t mean that you treat every child the same way. You still have to parent differently according to your child’s needs or diagnosis. Parents often ask me, “What’s the best consequence for this behavior?” They want a list of consequences they can plug in when their child misbehaves. But that’s not exactly the way it works. Consequences are very case-specific. For example, if your child can’t wake up and get ready for school in the morning, it may mean he is too tired. In this case, an effective consequence for not getting up in time would be to go to bed earlier. The earlier bedtime might seem like a punishment to your child, but in reality, it teaches your child that getting up in the morning requires getting enough sleep. And getting enough sleep means going to bed earlier. Consequences as a means to problem-solving are the foundation of this technique. The purpose is not punishment, it’s learning. The other problem with looking for a “magic consequence” is that it assumes that consequences alone are the solution to child behavior problems. But when you want to change what your child is doing, you really need a whole system of discipline, limit setting, coaching, teaching and problem-solving. Always ask yourself the lesson your child needs to learn. That lesson may or may not include a consequence. Think of consequences as a tool in your toolbox that you use according to the job. Some parents believe that if their child gets a really severe or long-term consequence, their child will never forget it and their child will never disobey them again. But if your punishment is too harsh, your child won’t feel remorse. Instead, he will probably just feel resentment towards you. And he won’t learn anything useful. For example, grounding your child for three weeks is ineffective. All it teaches your child is “how to do time.” You’ll also be lucky if your child remembers why he’s been grounded in the first place. Remember, it takes time and practice for your child to learn the life skills he needs. And he won’t learn those skill grounded for weeks on end. Here’s what you want to do instead. Give your child the opportunity to practice making better choices. Yes, appropriate behavior is a skill that needs to be learned through practice. And practice is done by using short-term consequences that tie a privilege to appropriate behavior. Is your child swearing? Take his phone for a few hours or a day and allow him to earn it back as long as he doesn’t swear during that time. If he earns it back, then great. If he swears again, take it away for another day, and repeat the process. Be consistent and give your child time to learn to behave better. One final note. Try not to take away special occasions, birthday or holiday celebrations, or anything the child cannot earn back. Taking away a video game for three days is very different from taking away a prom that your son or daughter will never be able to go to again. Instead, you want them to have opportunities to practice doing the behavior correctly and to earn privileges.